Welcome to the 19th annual INTERNET TELEPHONY magazine TMC (News - Alert) Labs Innovation Awards, where we honor innovative technologies from a wide range of areas. Winners this year are quite diverse – from Android-based 4k video cameras that can download and run apps, to state-of-the-art and ultra-secure DECT wireless headphones. Major trends are more features and functions, better security and a huge jump in reliance on AWS from numerous vendors. 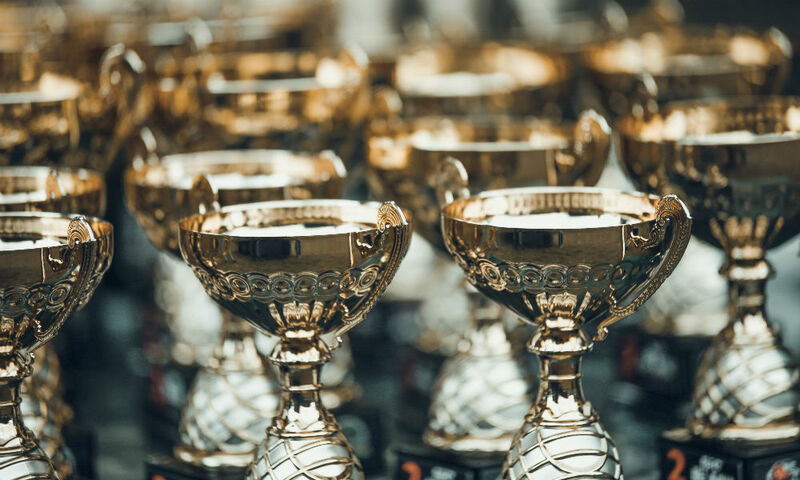 Other than that, there is a nice mix of collaboration, UCaaS and call center products on our winners list. As a special bonus – if you hate robocalls, read to the bottom to see how ClearIP tackles this problem. While there many video conferencing and Android (News - Alert) devices on the market, no one has done more to bring Android into the VoIP and UC space than Grandstream. Android was created as a mobile operating system, and it took a few years of research and development for Grandstream to integrate the full Android OS with VoIP and SIP. Some other video conferencing devices will support select, pre-loaded Android apps, but the differentiator here is access to the entire potential of the Android eco-system. The GVC3210 offers a powerful Android-based video conferencing device with built-in WiFi support and state-of-the-art video capabilities highlighted by support for 4k resolution. Designed specifically to make it easier than ever for SMBs to utilize video conferencing, the GVC3210 breaks down video conferencing barriers by offering a powerful yet flexible, easy-to-use and affordable device. It offers a completely flexible interface to allow users to customize their solution by utilizing any SIP, H.323 or cloud video and web conferencing service. Thanks to the Android OS, the GVC3210 also supports integration with any Google service, such as Google Calendar, and offers a familiar and intuitive Android user interface. As you might expect, there is full access to the Google Play Store, allowing the use of popular applications such as Skype and Google Hangouts. With 4K resolution, Miracast wireless screen sharing, built-in microphones and speakers and support for 2 HDMI monitors, the GVC3210 allows SMBs to build a high-end yet affordable and customizable video conferencing solution. Other exciting features include a 16-megapixel camera with ePTZ, dual-band WiFi for mobility, Noise-Shield technology to block background noise, bluetooth support for mobile devices, speakers and headsets. There are four microphones and two speakers as well. The device is compatible with any SIP, H.323 or Android platform – while also offering point-to-point functionality as a VoIP endpoint. For years, Grandstream has been known as a provider of solid products at reasonable prices. Some years back we tested one of their Android-based IP phones and were impressed at how the company blended the best of the mobile OS and a desk phone. Fast forward many years later and the company has come out with a high-end Android device, which is able to evolve its functionality through the use of the app store. The company has come a long way and we are impressed with the feature set of the GVC3210. After exhaustive interviews with 400 call center professionals and IT administrators, Jabra set out to design headsets for the evolving workplace. Respondents told them automation was handling the easy tasks leaving the higher-value phone calls to be handled by agents. Also, as rents have climbed, office spaces have gotten smaller and noisier. Open office environments certainly have to be an issue as well. The survey also showed agents need to be more mobile – they need to duck into huddle rooms for higher value conversations. Especially in fields like finance and real estate. Other factors that came up were the need for stereo quality, light weight, comfort, limited clamping force (so they don't feel like a vice on your head) soft cushions, customizability and, finally, durability. Interruptions were also an issue – respondents wanted others to know when they were talking. This exhaustive research resulted in a solution to these problems. The Jabra Engage 75 is made for professionals who spend a significant portion of their days on the phone providing high-value service to clients. Jabra classifies this profile as “traders,” but this also includes financial services professionals, real estate agents, account managers, and other professionals that spend significant time speaking with clients and working to resolve complex issues. These individuals report that they, on average, make 29 calls per day, are highly mobile, and spend one-third of their day away from their desks, and that noise (68%) and lack of privacy (>60%) impact their customers satisfaction. The solution is not limited to large enterprise, but was created for all call-centric businesses. The Jabra Engage 75 provides industry-leading wireless capabilities and incredible call clarity for a superior conversation experience. Engage is also the most secure professional wireless headset, with security features going beyond DECT security step C, protecting important calls from potential eavesdropping. The Jabra Engage franchise is the product of more than 115,000 hours of development by Jabra engineers and four registered new patents. The result is a new class of professional DECT headsets that offer superior wireless capabilities with incredible call clarity and overall sound experience. As a result of the DECT capabilities, Jabra Engage connects three times as many users in any given space – or ‘density’ – compared to competing technologies, without negatively impacting the call experience in terms of sound quality and range. With cybercrime on the rise, Jabra looked at existing DECT technology as the foundation and improved upon encryption levels. Specifically, the industry standard for headsets is/was 64bit encryption – with the new Engage Series, Jabra has upped this to 256-bit encryption, making it perfect for everyone from financial traders to military personnel. The solution is currently patent pending. In addition to the features previously highlighted, the Jabra Engage 75 is available in three different form factors to meet individualized workstyles and needs – convertible, mono, and stereo. Users can connect their Engage 75 to up to five devices simultaneously, increasing availability for customer calls. When professionals need to concentrate, an integrated busy light acts as a “do-not-disturb” sign to co-workers supporting productive conversations. We are impressed with the attention to detail with the Engage 75 headset, from enhanced security to greater density. These and other features listed above make it a top headset on the market for the most demanding users. Easily manage queues, hunt groups, and agent performance with QLIVE from Metropolis Corp. It monitors the hunt pilot activity and native queuing capabilities of Cisco (News - Alert) Call Manager, Avaya CM or IP Office to provide visibility into call center performance, monitor service levels, provide live and cradle-to-grave reports, and proactively notify staff when agent availability or call volume drops below a customized threshold. It also enables the client to setup key performance indicators, such as service levels, abandonment rates, extended hold time, or agent availability KPIs, then trigger threshold alerts to notify supervisors proactively whenever performance is threatened. QLIVE is designed to bring UC to the contact center – providing the reports and other information needed to keep everyone informed. The solution provides real-time wallboards and KPI alerts by monitoring the hunt pilot activity and native queuing capabilities of your Cisco or Avaya solution. QLIVE's dashboard features include configurable tools to view the call data that matters most to your business. Display the performance of your queues, caller abandonment rates and agent activities with intuitive drag-and-drop navigation. A supervisor can easily manage your agents with at-a-glance dashboards that provide insight in real time on the status of service levels, queues, and agent teams. Agents receive instant feedback on their daily call statistics and trends with QLIVE Agent Dashboards. In addition, multiple wallboards can be used concurrently to display different queues or groups. The company can see live calls route through the queues and observe changes in agent activities in real time. Thanks to proactive KPI alerts, managers can be notified whenever a call center doesn't have enough agents available, when queues are backing up, or whenever service level drops with customizable KPI Alerts in QLIVE. This allows supervisors to be notified immediately, allowing them to rapidly react to a situation. Those features, cost savings, and the boost in monitoring capabilities make this solution worthy of distinction. Companies can populate a notification on your screen or email your entire team. With QLIVE's notification tools, you can take a proactive approach and quickly make any necessary adjustments required to maintain your call center's service level goals. In addition, QLIVE allows you to view live agent activities and queue statistics to monitor trends and ensure proper staffing and service levels. It also provides real-time and historical reports, so you can identify the source of higher abandoned calls rates, troublesome call patterns, and efficiency of agents. We chose QLIVE because call centers need to focus on UC productivity. Those features, cost savings, and the boost in monitoring capabilities make this solution worthy of distinction. Simple to use and easy to manage, Mitel OfficeLink delivers the essential features of a business phone system in a mobile application. Mitel OfficeLink enables users to answer and maneuver multiple calls in real time from their mobile phones, wherever they, their customers or their colleagues happen to be. Mitel OfficeLink is uniquely focused on traditional voice-centric workflows that feature multiple incoming lines, conferencing, transfer, hold, hunt groups, group calling, call park and more. Other mobile UC apps lack many of these business voice features. OfficeLink is a cloud-enabled mobile application (through Mitel’s Cloudlink platform), allowing for interconnectedness between Mitel’s Onsite MiVoice Office 250 SMB office phone system and mobile devices. The goal of OfficeLink is to deliver a business desk phone in a mobile application – Mitel OfficeLink is designed to deliver the essential, mid-call functionality features of a business desk phone in the palm of users’ hands. The CloudLink platform is built on AWS and OfficeLink can be downloaded from the Apple and Google Play app stores. To enable the MiVoice Office 250 Onsite platform, a small, plug-and-play CloudLink gateway device is added to the MiVoice Office 250 server. For instance, if you offer SIP trunking, you may require a SIP gateway at the customer premise and the calls are routed over IP to your hosted voice termination network. Another example: You are a hosted CRM contact management solution. At the customer premises, you require just a browser and the hosted side consists of Oracle, Linux servers running Apache, Clustering for redundancy, etc. Cloudlink/OfficeLink is the first solution to cloud-enable and integrate mobile applications with an onsite communication server to deliver a seamless approach to deliver mobile applications purpose-built for specific business communities. The CloudLink Platform allows Mitel to develop communication oriented micro-services and leverage the global AWS offering to deploy applications globally (built from selected micro-services) and integrated across many disparate onsite communication server systems. This will enable Mitel to quickly deploy globally and maximize global market economies, while limiting development costs for numerous communications systems deployed within various markets. With several purpose-built onsite communications platforms in each of the small to large customer segments, Mitel faces a challenge of providing a path to the cloud while not abandoning previous valuable investments. The CloudLink platform, which is the backbone of the OfficeLink product, provides a unique path for an onsite customer to leverage the business benefits of a cloud-based application deployment. The product has distinguished itself by working on Windows, Macs, and Linux machines. Mitel provides a very strong selection of cloud and onsite communications solutions. For those small businesses that require an onsite communication solution (whether for security, regulatory, operational or other reasons), Mitel’s OfficeLink provides a seamless way to leverage targeted applications deployment, and the advantages of OpEx deployed applications via the cloud. So, when competing against Cisco and Avaya, Mitel provides a solution to advance business productivity through cloud deployed apps without having to replace communications servers or without having to transition completely to the cloud. When competing against traditional cloud communications providers, Mitel can deliver the advantages of an onsite solution, which others do not offer. It is this flexibility that differentiates the solution and makes it award-worthy. Nextiva Office is a complete unified communications solution for businesses of all industries and sizes. In addition to providing companies with feature-rich cloud phone service, Nextiva is advancing the way companies collect and use call data to make informed business decisions. The complete Nextiva Office suite of products includes cloud phone service, a reporting and analytics tool, a mobile app, cloud backup and storage service, as well as virtual faxing. In 2016, Nextiva introduced a new way for businesses to manage their phone systems – the NextOS Portal. The web-based client allows Nextiva Office administrators to manage their company’s users, features, devices and locations all in one simple and intuitive interface. The NextOS Portal was developed to improve the user experience and save today’s businesses valuable time and resources. Also, a dedicated NextOS user portal was released so users can manage their own feature settings for a more personalized experience. In addition to the NextOS Portal, a powerful and intuitive reporting and analysis tool was recently released that seamlessly integrates with Nextiva’s cloud phone service. Nextiva Analytics allows businesses to access and manipulate their call data visually through customizable reports, wallboards, dashboards, and company-wide gamification. Businesses can take advantage of over 225 report combinations and infinite ways to analyze both real-time and historical data. Additionally, data can be displayed in easy-to-read graphs or traditional tables, depending on preference and business uses. With the addition of both Nextiva Analytics and the NextOS Portal in 2016, the Nextiva Office communications suite is more powerful than ever before. Companies can leverage the flexibility, mobility, and scalability that the advanced communications features provide to gain a competitive advantage. Nextiva Office saves professionals valuable time, increases productivity, and helps them stay connected to their colleagues and customers from anywhere. Lastly, Nextiva’s Service team is available for any questions or concerns users have about features or products, from personalized system walk-throughs to providing instant troubleshooting. Whether customers like to communicate by phone, email, chat or social media, they’re always able to get in touch with an experienced technical specialist. Nextiva explains the company is dedicated to helping people run their businesses efficiently and profitably, and the addition of these enhancements to the Nextiva Office suite make it easier than ever to conduct business from anywhere, at any time. The target market is any company that needs to communicate. From mom and pop shops to Fortune 500 companies, businesses of any size can benefit from Nextiva’s services. Each location that uses Nextiva Office needs a modem with cable or DSL Internet connection. Internet bandwidth must be able to support business network activity, such as computer usage, and also be able to handle approximately 100 kbps up/down for every VoIP call. The Nextiva core platform, NextOS, resides in data centers across North America with the highest security protocols and are connected with dual OC48 (2.5 Gbps) rings to create a redundant call network path. The data centers have multi-factor authentication for entry, biometric security scanners, bullet resistant glass, 24x7x365 security as well as video surveillance. They are SSAE 16 certified, SOC II audited, and offer PCI-DSS certification. Each data center has a dedicated power grid with sophisticated energy consumption to guarantee 100% up-time. Nextiva Analytics has been groundbreaking in using existing technology for new purposes. While many VoIP companies have the ability to provide users with call logging and information, Nextiva Analytics takes that information and transforms it into usable graphs, charts, and more. With over one hundred report templates, timed report sending, variable date ranges, and many other features, companies are set up for success without having to spend hours on personalizing the product. With these standard reports and all available information, customers are able to use Nextiva Analytics for staffing, quality assurance, training, and more. They can track their most popular call times to schedule appropriately, listen to recorded calls, and figure out who their highest and lowest-performing agents are to adjust. Advanced Call Recording is a Nextiva Analytics add-on that breaks new ground in quality assurance and training for business communications companies. While many VoIP providers offer call recording, Advanced Call Recording goes above and beyond in features. Firstly, the call recordings are synced directly to Nextiva Analytics, so there is no back and forth between portals. Simply select a call in the call log, and click the speaker icon to listen to the call. Administrators can also set up surveys for training purposes. They can create questions such as, “How would you rate the opening of this call?”, and QA analysts can rate the calls with these questionnaires. Next, the calls can be trimmed to focus on just a certain parts. The trimmed calls, full calls, surveys, and notes can all be directly emailed from Nextiva Analytics to whomever needs the information. This is often to send along praise for a good call, or to use a call as a training example. Another differentiator, Nextiva has 100% in-house support for our customers. There is no outsourcing. Every person who answers a support call or email is a full-time employee of Nextiva. In the past six months, the company introduced HIPAA compliance and has added more features to its administrative dashboard. Finally, there were also a number of updates to the administrative portal options. They include additional account information tiles, such as phone numbers in use and lines in use in order to provide a more inclusive, overall picture of the business. Time zone capabilities have also been expanded, specifically, making most reports available in the Puerto Rico time zone. Billing is done through Rev.io/BluLogix/Zuora. The OneBill platform delivers all the above functionalities in a single cloud platform that obviates the need to buy multiple siloed systems. OneBill is a Billing-as-a-Service platform that simplifies the complex billing and revenue of emerging services, such as UCaaS, Cloud Services, IoT etc. OneBill is an enterprise-class scalable, flexible and configurable platform that fully automates the end-to-end Lead-to-Cash process. Several service/solution providers and their resellers successfully use OneBill platform to manage their business and operational (BSS/OSS) needs, such as Configure-Price-Quote (CPQ), Order Management, Customer Relationship Management (CRM), Billing, Invoicing, Taxation, Provisioning, Service Activation and Reseller/Channel partner management. The OneBill platform enables solution/service providers to bundle products and services from any carrier, any device vendor/distributor, allowing them to create “ONE-BILL’ to maximize their market and margin opportunities. Like many other solutions who have won this year, OneBill is hosted on AWS and customers need only a browser to access the platform. OneBill’s highly scalable, high-availability multi-tenant architecture allows all our customers tenants to be hosted in a single application service, which can scale vertically as well as horizontally. Each customer can customize their tenants for their own branding, including the URL to access the platform. Branding is extended not only to the service provider, but also to all the resellers, which gives them to ability to offer Branded Bill-on-Behalf-of capability, a unique feature to the OneBill platform. N-tier channel management: The service provider can bring in wide variety of partners, such as agents, resellers, vendors, distributors etc. Multi-party settlement: The platform handles multi party settlement on how the revenue should be distributed across these channel partners. Self-Care Portal: Branded self-care portal for offering best customer experience for managing their purchases, orders, shopping cart, payment, subscription management actions, like upgrade/downgrade, pause/resume, cancel/renew all by customers themselves. Service Activation and Provisioning framework: State-of-the-art configuration drivenactivation and provisioning platform that caters variety of verticals (unified communications, cable, IaaS, SaaS, IoT services) through seamless integration between the source systems and offers real-time provisioning and activation experience. Rules engine framework: OneBill has customized and innovated on top of Drools (used for rules engine) to deliver complex pricing/business/settlement rules. Customers are able to create complicated price offering, product inclusivity/exclusivity business rules using this framework. The same framework is also applied to derive sophisticated N-tier settlement capability to apportion the revenue across different parties in the channel eco system. OneBill’s mission is to automate the entire Order-to-Activate-to-Cash process by eliminating all the swivel-chair type of operations and remove multiple siloed legacy components. Its workflow engine is called ProActive and it decomposes the order and orchestrates it across different carriers’ provisioning/activation platform. For example, a typical UCaaS order might consists of 1) DID ordering 2) Configuring hosted PBX platform and 3) Shipping a phone device to the customer’s premises. In this order, three different carriers are involved – a SIP trunk provider, a softswitch provider, and a device distributor. OneBill’s ProActive module automatically decomposes the order, orchestrates the decomposed order elements across all the three carriers’ platform for provisioning and activation of the UCaaS service. OneBill platform has a rating engine which can automate UDR (Usage Detail Record) processing for any carrier. For communication providers, it can be a CDR (Call Detail Record) that needs to be rated for Toll-free calls, International Calls, E911 calls etc.. For IaaS provider, it could be usage records coming from Azure (disk usage, CPU usage etc.). Multiple Rating Engines can be setup to process usage records coming for disparate services allowing them to create a true convergent invoice, hence the name ONEBILL. Zapier integration for external applications: Integration with Zapier which allows OneBill to interact with thousands of third-party components such as CRM (Zoho (News - Alert), Salesforce etc. ), Accounting Software (Quickbooks, Xero etc. ), Service Desk (Zendesk, Freshdesk), Professional Service automation tools (Connectwise, Autotask etc.). Integration with BroadSoft PBX platform: ProActive module now enhanced to talk to BroadSoft PBX platform. Integration with Payment Gateway solutions such as Merchant-e-Solutions, Moneris. Cryto support is on its way. New white-labeled merchant services using Digitzs, which allows the resellers to create their merchant accounts instantaneously. Enhanced Service Desk module to include ticket creation through email, automatic ticket assignment, SLA monitoring, escalation workflow etc. Star2Star’s Full Spectrum Communications Solution enhances business communications with end-to-end solutions that deliver the ultimate flexibility, scalability, and productivity. Full Spectrum Communications unifies voice, video, mobile, chat, fax, presence management, and more into a single, easy-to-use system. Companies can select their preferred technology from a range of options, including hosted to hybrid, reduce their costs, and increase productivity. All Star2Star solutions include advanced UC features, built-in business continuity, and the power of SD-WAN for crystal clear call quality. The target market is small, midsize, and enterprise level companies in need of communications solutions and services, especially those looking to switch to Unified Communications from siloed communications systems or traditional PBXs, as well as companies with UC who need a better plan and bottom line. The company sells through resellers and agents. StarSystem Hybrid components include the StarBox Voice Optimized SD-WAN, which sits at the customer premises and is supported by Star2Star’s Constellation Network and suite of cloud-based services hosted at its highly reliable, redundant data centers. The StarBox connects over IP infrastructure to the Constellation Network, which runs on a collection of call routing nodes and data centers distributed across the country. StarSystem Hosted is a fully hosted option that does not require any hardware on-premises. The StarSystem Hosted platform is managed completely through the online portal and runs on a collection of ultra-fast fiber networks dispersed all over the globe. The company proudly states its Full Spectrum Communications Solution offers a range of options for businesses of every size and a variety of needs, including hosted and hybrid. All solutions in the Full Spectrum Communications portfolio unify voice, video, mobile, chat, fax, presence management, and more into a single, easy-to-use system that can be customized for unique business needs. Full Spectrum Communications includes the StarSystem Hybrid solution, which combines aspects of both hosted and on-premises communications solutions to create a higher quality solution – the high quality of an on-premises system with the flexibility and cost-effectiveness of a hosted solution. StarSystem Hosted, the fully hosted option, streamlines and simplifies communications with a centralized portal. It also offers unique features including the Callflow Designer, which allows end users to create custom callflows, and custom CODEC options for ultimate flexibility. All of Star2Star’s solutions leverage the power of SD-WAN, allowing companies to manage their networking resources on a granular level. Star2Star is one of the first companies to leverage voice optimized SD-WAN controls, with its flagship StarBox Voice Optimized SD-WAN solution. Star2Star’s integration platform, StarPaaS, completes the portfolio with a catalog of turnkey and custom integration options. StarPaaS allows companies to integrate with any third-party application to create ideal workflows. The Full Spectrum Communications Solution offers customers end-to-end unified communications, ultra-reliability, flexibility, and scalability. We awarded the company because the Full Spectrum Communications Solution allows for SD-WAN controls, turnkey and custom integrations, dynamic scalability, QoS voice features, line pooling, line bursting, chat, video conferencing, fax, mobile, and many more features. ClearIP is a cloud-based platform for VoIP telecom applications, including SIP Analytics, real-time fraud and robocall prevention software. Other applications include routing, secure telephone identity, reputation lookup, caller ID name lookup, whitelist/blacklist and Shield database lookup (a database of known bad numbers). SIP Analytics provides real-time fraud control by analyzing SIP INVITE messages and responding to session border controllers or softswitches with instructions to block or divert a call before call setup. Customers set up a SIP trunk and point it to ClearIP as the first routing destination. 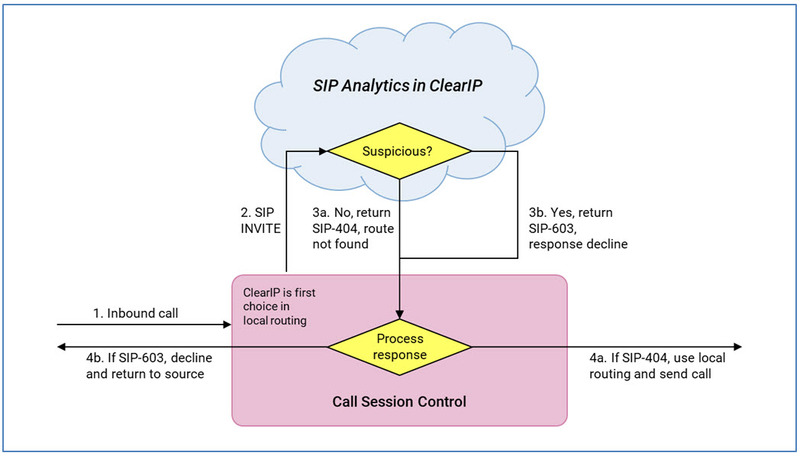 ClearIP applies the customer-selected services to the SIP messages. ClearIP then sends a return SIP message to the SBC—the message type controls how the customer’s call session control will handle the call and may contain information related to the services requested, such as caller ID name, STI authentication or verification info, and so forth. Cloud-based solution to offer real-time fraud detection based on analysis of SIP messages (SIP Analytics). Platform of any type to stop outbound toll fraud and inbound robocall and fraud scams. Fully featured fraud management system to offer secure caller ID using digitally-signed SIP identity headers as defined in the STIR/SHAKEN frameworks. Call Routing to multiple destinations. By combining all these information transactions in a single dip, ClearIP reduces network overhead at the softswitch or SBC, simplifies operations and lowers cost. The VoIP industry is served by several fine companies that offer fraud management systems (FMS). However, TransNexus developed ClearIP to provide a fraud FMS that goes beyond what these other systems offer. Here are further differentiators of ClearIP. Easy fully-functional FMS is easy to acquire and includes free evaluation, month-to-month fees based upon call volume and features used, no long-term obligation. It stops costly fraud attacks sooner. It’s easy to implement and, unlike CDR analysis, there’s no complicated data mapping. Unlike network probes, there’s no hardware to install (which could slow down the network), and it’s simple to configure so customer can get started faster. It’s also easy to use and automatically blocks calls – some other systems just issue warnings, so customers need case management tools to dispatch staff to manually stop fraud attacks at all hours. It is self-learning with adaptive fraud triggers, starting with basic default settings, then adapt to actual call activity to deliver accurate fraud detection with fewer false positives. It provides faster protection and can save thousands in staff costs. The FMS is easy to maintain, with no on-premises hardware or software, saving space, money, and staffing requirements. The low-disruption fully-featured FMS uses standard SIP messages and behaves like any other SIP device, so customers won’t have to revamp their networks to make it work. It’s safe, reliable and unobtrusive and only blocks narrow subsets of call types – legitimate calls continue uninterrupted, preventing fraud losses while providing reliable service users expect. Precision controls let users select broad defaults or get very specific. Precise fraud-handling policies can be set by calling party and call destination—the level of granularity is up to each customer, greatly reducing the need for manual intervention and saving staff workload. Robocall handling screens robocalls by reputation service or divert to CAPTCHA gateway, sparing customers from annoying robocalls often designed to perpetrate fraud. Customers are billed for a precise set of features they’ve selected to use, including segmentation by call traffic subsets. Fully-featured FMS ready-to-go with Secure Telephone Identity enables you to securely authenticate and verify caller ID and makes the company future-ready for potential regulatory requirements or market expectations to kill annoying, illegal robocalls. ClearIP has powerful analytics capabilities, which enable users to inspect call records, run reports, generate charts and view geographical maps to gain insight into many aspects of call activity. It was launched in October 2017 and, since that time, several improvements and feature enhancements have been made. The most recent include the addition of CNAM (caller ID name lookup) and Reputation lookup, which are helpful to service providers who wish to offer their customers services to help avoid robocalls. The true breadth of the solution and number of enhancements are why we chose ClearIP this year.